The application process for the Sochi Olympics volunteers is in full swing. The Winter Olympics in Sochi commence in less than 12 months, and the Sochi 2014 volunteer movement has stirred up a wave of social activity in Russia. Candidates still have one month left to submit their applications, despite the fact that there are already three times more volunteers for the Games than there are vacancies. All Sochi 2014 volunteers start their journey at the website Vol.sochi2014.com. After logging on and filling in a detailed application form, every volunteer has to go through a round of tests: the first trial is to check the applicant’s diligence, while the second test evaluates applicants’ English-language proficiency. Any foreigner between the ages of 18 and 80 can apply to become a 2014 Sochi Winter Olympics volunteer. The application deadline is March 1, 2013. Applicants who speak Russian and English will have an advantage. The Organizing Committee pays for accommodation and meals. 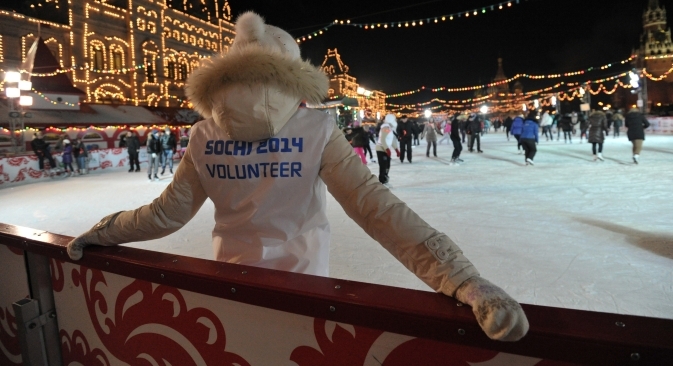 Volunteers are supposed to pay for their own tickets to Sochi. The Sochi 2014 organizing committee will provide all volunteers with accommodation and three meals (including buffet-style breakfasts and dinners) per day. Volunteers are expected to pay their own travel expenses, though. They will stay at a health resort in Sochi’s Adler District for the duration of the test events. During the Olympics, they will stay in special houses in the Olympic village, which are currently being built. Each volunteer will be approved to work at a single Olympic facility. On their days off, volunteers will be given free tickets to all events. Even perfect English and the desire to help their county hold its first winter Olympics are not enough to guarantee Russians a place amongst the Olympic volunteer team. First, they will need to complete a training course designed to familiarize them with the basics of the organization of the Games and the Olympic facilities. Russian volunteers involved in the London Olympics are also involved in these workshops and trainings. Madina Tsadina, formerly a London 2012 volunteer, provided an example of why such training is necessary: Adidas wanted to sanction some athletes and void their medals in London, because the latter wore uniforms of a different brand to the medal ceremony, which is in violation of the contract. The problem was resolved, but everyone came out of the debacle upset — including the athletes. Some volunteers will be responsible for this side of the Games in Sochi, to avoid the same mistakes. All of the volunteers will not only have to attend workshops; volunteers must also attend test events in Sochi, in order to see what the real Olympic events will look like, except on a reduced scale. During the test events, they will meet at least 15 Canadians, Americans and Norwegians who volunteered at the previous Winter Olympics in Vancouver; the group has been invited to give advice and train coordinators and volunteers for the Sochi Games. John Servold is the supervisor of the “RusSki Gorki” Jumping Center, which is one of the most expensive and sophisticated Olympic facilities in Sochi. “I am a Canadian with Norwegian roots. I was working on the hills in Olympic Vancouver. ‘RusSki Gorki’ is a formidable hill complex with breathtaking views, but the events won’t be easy, because of the warm climate and the weather. The only piece of advice I have for you is ‘hope for the best, but prepare for the worst.’ The weather will always have the final say, so we must be ready for any sort of weather,” Servold said, directing counsel at incoming volunteers. Most of the volunteers are students. This is no small wonder: volunteers are expected to work hard under pressure and have a lot of free time. Lyudmila Cherkasova, who currently works as a cleaning lady at RusSki Gorki, is a Sochi resident with decades of volunteer experience. “I have been a Nordic combined skier since I was a teenager. I worked in the steering committee of the Sixth USSR Spartakiad, and I remember that all services had to be well coordinated — catering, cleaning and supervision. Thirty years later, I keep one of the most important and expensive Olympic facilities clean. I hope I will be able to watch the events and maybe have my picture taken with a champion,” said Lyudmila.